This may seem like just five options, but here's the thing. You can make a big batch of muffins, a big batch of nut-free banana bread, a big batch of quesadillas, a big batch of puff pastry pies, and a big batch of meringues, AND FREEZE THEM. You could even do a couple variants on the muffin/quesadilla/pie theme, should you have the energy. But, in my opinion - the same-ish lunchbox, once a week? Not a biggie. Do this today - before school starts again, for us Queenslanders - and you are set for April/May. You can use all your newfound time to catch up on yoga in the morning, or coffee, or see if you can nail a tree-pose-with-cappuccino. 1 - banana bread :: chicken + pea pies :: dried apricot :: grape "eggs" in alfalfa sprout "nest"
Just so you know, Nelle's class has a mid-morning fruit snack and morning tea - all before lunch, which is why I don't fill up the lunchbox too much. You can vary quantities according to your child's appetite. NOTE: for mid-morning, I usually send grapes or a banana, depending on what she's been eating for the rest of the week; and for morning tea she usually gets toast, crackers, or yogurt. Puff pastry pie - I don't usually follow a recipe, but all you have to do is fold small rectangles of puff pastry around cooked fillings you know your child likes (like meat/veggies/cheese/tomato). Crimp the edges with your finger, to keep the fillings from oozing out, and use a knife to poke a few holes in the top of the pie to prevent explosion. Bake in a preheated oven for 10-15 minutes, until golden brown and flaky. Cool and slice. NOTE: I try to avoid cheese in these pies, because I know she'll have it a couple times in her lunches later in the week. Large dried fruit - Whatever's your favourite, but mix it up week-to-week. Try apricots, dates, mangoes or figs. Grape nest - The presentation is key here: make it look interesting, and it will become imminently more edible. Just 4 grapes on alfalfa sprouts, and Nelle thinks it's the coolest thing ever. Crunchy raw veggies (not carrot) - Whatever's your favourite, just not carrots - we'll have those later in the week. Try capsicum (peppers) or snow peas. Quesadilla - Simply fold a tortilla over cheese (and meat or jam) and cook in a toastie maker or on a hot griddle until the cheese is melted and the tortilla is golden. Cut into wedges. I usually make extras and freeze them. Beans - We like kidney beans, black beans, lentils or baked beans - sometimes plain, sometimes with a little tomato puree stirred through. Don't forget a spoon if it's saucy! Small dried fruit - We like raisins, cherries or cranberries. Veggie muffin - Use whatever you've got ... zucchini, carrot, sweet potato ... but go nut-free. Cheese - I try to vary this, too - sometimes she'll get a cheese stick, other times slices or cubes of different sorts. Antipasto - I used raw tomato here, which can hardly be called antipasto ... but I often mix the tomatoes with olives, and it just sounds better that way. Am I right? Meat - Use whatever you have leftover from dinner. For us, that's usually steak or lamb. I don't send fish - it's too potentially messy/stinky on her school uniform. Pasta - I almost always have made-up pasta shapes in the fridge for kiddie emergencies. Nelle *loves* them in her lunch! Go for shapes that are easy to eat, and add sauce if you like. Fruit slices - We like apple or pear, but brush each slice with a little lemon to keep it from going brown. Roast veggies - Again, go with what you've made for dinner. Ours usually include roasted sweet potatoes, pumpkin or potatoes. These lunchboxes sound delicious. I've hust purchased a compartment lunch box for work and you've given me some great ideas. What lovely lunches you fix for Nelle! 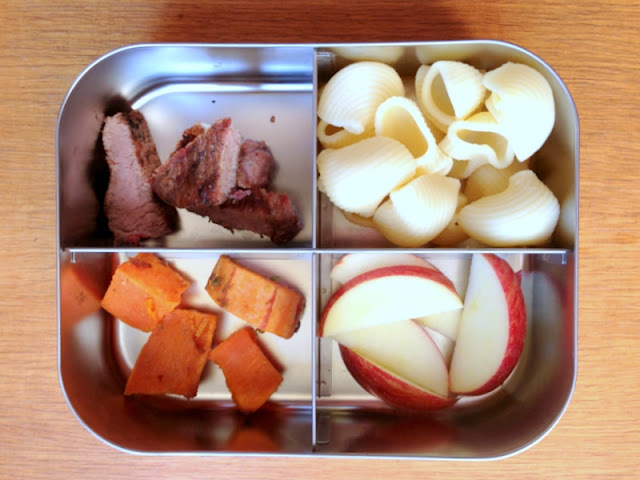 These are such great & different lunch bentos! I especially love the simplicity--but also the variation from usual lunch dishes. Hooray!